I’ve been posting recipes for heavy dishes lately so I’m in the mood for a little salad! This dressing comes courtesy of a fellow blogger and film lover, Donna Hill. Donna recently discussed the history of eating at the movies (with great photos and video clips!) on her blog, Strictly Vintage Hollywood. She concluded with a recipe for Green Goddess salad dressing, created at San Francisco’s Palace Hotel in 1923. The herbally tinted salad dressing honored a hotel guest, the actor George Arliss. Arliss was then starring in a popular play titled The Green Goddess. He would go on to appear in both silent and sound film versions of the story. The Green Goddess is a hoary chestnut full of imperialist ideas. 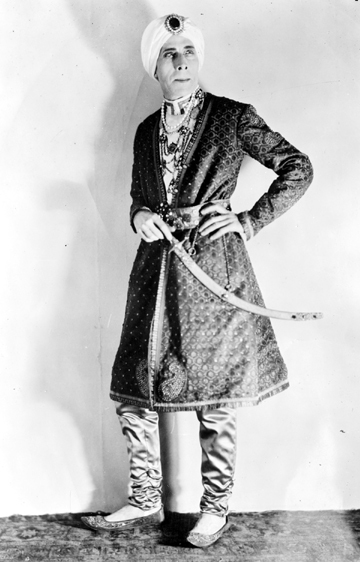 Arliss played the Rajah of Rukh, a fictitious and stereotypical oriental potentate. Shrewd but selfish and vindictive, the rajah threatens to execute a party of Englishmen who accidentally land in his kingdom—and tries to force the wife of one of the men to become his paramour. The play and film’s depiction of “Barbarous Asia” is appalling even by that day’s standards, but it is interesting as a period piece. A historian of colonialism could certainly make hay out of the stereotypes. And Arliss came across as both elegant and funny in his wickedness—much more appealing and effective, in fact, than he was in the picture for which he won the Academy Award for best actor, Disraeli. Neither film version of The Green Goddess is available on home video at present. Happily, the Alice Joyce Website offers stunning stills of the 1923 silent production. (Joyce played the object of the Rajah’s lust in both 1923 and 1930). Turner Classic Movies occasionally shows the 1930 sound version and offers a couple of clips for viewing on its web site. While you’re watching them, do try the dressing. 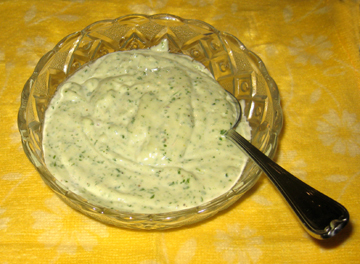 If you’ve never had Green Goddess Dressing, imagine a cross between Caesar and ranch dressings. (I love both.) It’s smooth, flavorful, and tangy, and the herbs give it lovely green flecks. Thank you, Donna! Place the garlic and anchovy fillets in the bowl of a food processor and pulse until minced. Add the herbs and lemon juice, and process again; then add the mayonnaise, salt, and pepper, and process again until smooth. Taste for seasoning and adjust seasonings accordingly. 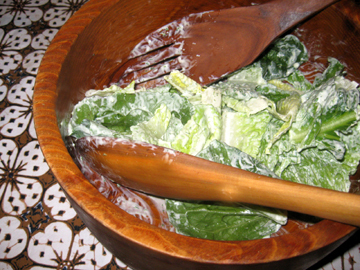 Serve over a split romaine heart. (Actually, I just shredded some romaine, which worked beautifully.) Garnish with a sprig of fresh basil or tarragon if you wish. Makes about 2 cups of dressing. This entry was posted on Friday, April 9th, 2010 at 4:00 am	and is filed under Salads and Dressings, TV and Film History. You can follow any responses to this entry through the RSS 2.0 feed. You can leave a response, or trackback from your own site. Who knew George Arliss had a salad dressing named after him! “The Green Goddess” was filmed a third time in 1943, as a B-movie called “Adventure In Iraq” with character actor Paul Cavanagh in the Arliss role. The action was updated to World War II and the lead was given to John Loder as a pilot. This version is available on DVD. Mmmmm, thanks for that recipe! My Mom used to make that too. I don’t like the taste of tarragon but basil sounds good. Maybe tonight….. Thanks Tinky for cross posting and trying out the recipe. I’m honored to have made it onto your blog. Oh my! That sounds delicious – -I’m totally making this for an upcoming dinner party! Yum! I love your blend of information and food!! The dressing sounds good – another one to save in my file of things to try. Hmmm. Mr. Arliss looks suspiciously like the wicked Mrs. Danvers gazing out a window at Manderly. But I’ll take a flyer on that dressing – it sounds wonderful (as anything would that includes basil and anchovies).